– The amazing quality of 2016 merits the 9% increase in price from 2015. 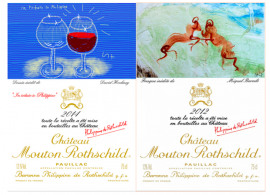 – History: Since 1853, Mouton Rothschild has been under the ownership of Baron Nathaniel de Rothschild and his descendants. In 1922, Baron Philippe de Rothschild, Baron Nathaniel’s great-grandson, of the château. Since 1924, all Mouton wines were bottled at the château and starting in 1945, all Mouton labels are designed by different artists. The hallmark year for Mouton is 1973 when it became the first château to be elevated from second growth to first growth thanks to the tireless lobbying of Baron Philippe. – Current Owners: The children of Baroness Philippine de Rothschild are co-owners of the Château: Camille Sereys de Rothschild, Philippe Sereys de Rothschild and Julien de Beaumarchais de Rothschild. – Each year’s wine label is different, designed and created by some of the world’s great painters and sculptors. – The 1970 vintage took second place, and was the highest ranked French wine, at the historic 1976 Judgment of Paris wine tasting. Despite the passing of Baronesse Philippine de Rothschild in 2014, the handover of the reins to her three children has been smooth. On the technical side, with Philippe Dhalluin at the helm, the wine is moving from strength to strength. 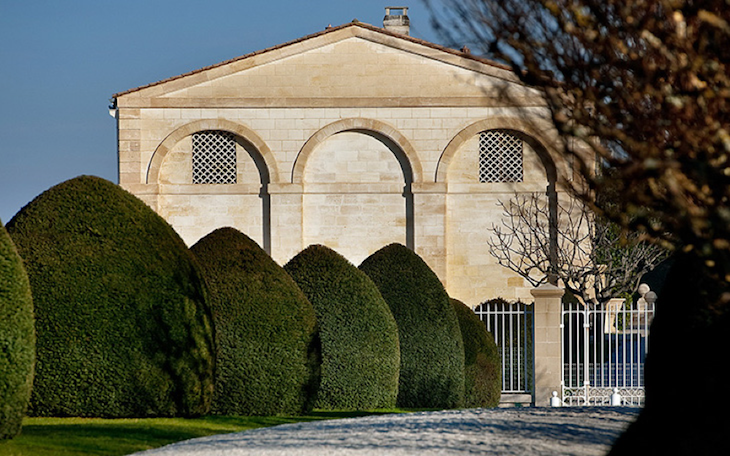 Since the 2012 vintage, Mouton displays more finesse, detail and preference for elegance rather than power. Mouton will always be more expressive and flamboyant than its neighbor and fellow classified first growth cousin, Lafite, but in recent years, there is a delicacy and nuanced layers compared to the past. The wine has moved beyond sheer intensity, ripeness and strength. 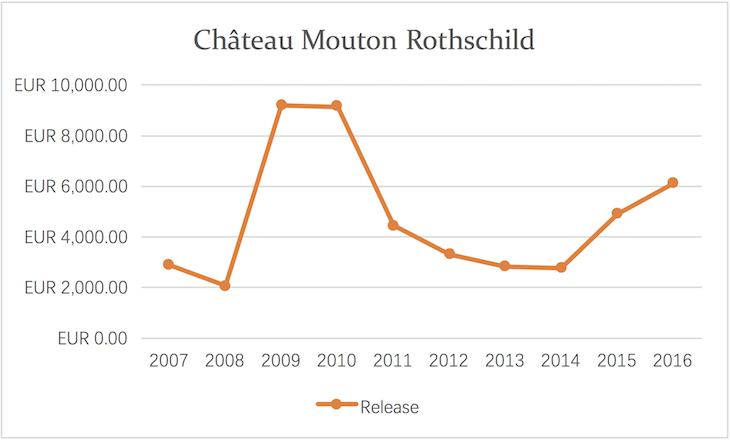 For more insights into Mouton, click here. And to see my interview with Philippe Dahluin, click here. Gorgeous, subtle, layered Mouton with delicate and detailed flavors that linger on the palate for a long time. The density of the tannins combine with wonderful freshness and layers of flavors that range from dark berries, savory spices to cedar and earth. A glorious Mouton that has stature and concentration without any heaviness. The blend is 83% Cabernet Sauvignon, 15% Merlot, 1% Cab Franc and 1% Petit Verdot. The latter two varieties were co-fermented. Sweet, opulent and quite forward for a first growth, this vintage of Mouton has charm and a wonderful approachability. The firm tannins and body is well well structured but wrapped around ripe, sweet blackberry and plum fruit. A beautiful Mouton with charm and sweetness. Intense wine with velvety tannins, dark cassis notes and savory herbs. This is a restrained Mouton that has power and good density. The long hang time and growing period in this vintage means everything was concentrated – tannins, flavor and acidity. The alcohol is just over 13%. This is a wine to lay down. Elegant Mouton with a light touch. Not a rich, heavy style but one that is elegant, harping back to the 1980s when the shape of the wine was slimmer. 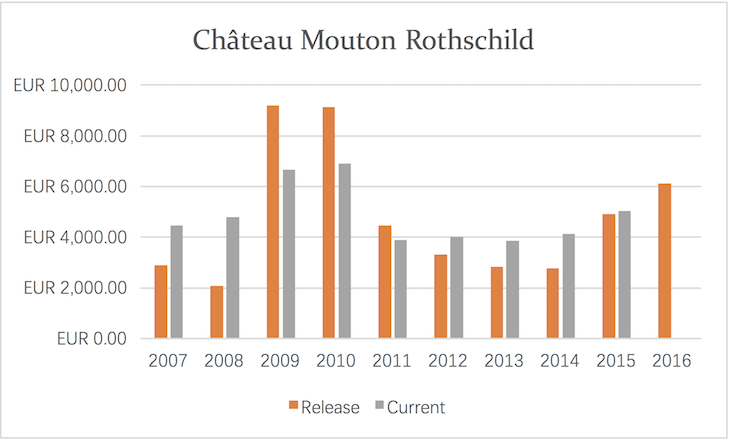 This is the smallest production of Mouton over the past 40 years, less than in 1991. Blend is 89% Cabernet Sauvignon, 7% Merlot, 4% Cabernet Franc. Mouton is slowly increasing the Cabernet Franc in the blend. A medium weight Mouton with vibrancy and freshness. Intensely focused Mouton with lively fresh dark berry flavours and velvety tannins. Balanced, well made 2012 with elegance and finesse. Fairly light Mouton with accessible forward dark fruit flavours. Velvety tannins and fairly long length. Not a powerful wine but perfect for earlier drinking than Mouton’s other recent vintages. A glorious, aromatic Mouton that is one of the best vintages from the 1960s that I have every tasted. Still vigorous with layers of dried fruits and rose petals with a lovely sweet spiciness in the finish. Silky textured with incredible length. A gorgeous wine that is drinking beautifully now. This is an elegant, medium bodied mature Mouton that offers layers of cedar, dried herbs and sweet spices. Tannins are suave and supple with flavors that linger on the finish. Starting its decline so best to enjoy now. This Mouton is a wonderful surprise. I expected it to be good but was impressed with the wine’s intensity, youthfulness and balanced sweet dried fruit flvors. This wine is harmony in carnate with a long length filled with sweet fruit flavors. The large format size adds to the wine’s youthful vigor. The 1986 was tasted next to the 1985 which was much more open. This vintage is still quite firm, dense and tannic in comparison with layers of cassis, sweet tobacco and cedar notes and a persistent finish. While the 1985 is drinking well now, this vintage tastes like it has a longer life ahead. This sweet, generous Mouton hugs you from the start. The palate is filled with ripe dark berry fruit, cedar and sweet spices with tannins that are gentle, firm and velvety. Balanced, easy to enjoy and love, this is a great vintage for Mouton. Decanted for 3 hours, this 1996 Mouton is a powerhouse – a young, gorgeous wine at its prime. This vintage is the epitome of the power, voluptuousness and sweet sensuality that Mouton can possess in the best years. Long, supple full bodied with a persistent finish. At 20 years old, it is still a teenager.